It is unusu­al to find exposed rock along the shores of the lakes in this part of Alber­ta, but this beau­ti­ful shore­line along Oliv­er Lake in the Min­is­tik Game Bird Sanc­tu­ary just east of Edmon­ton had sev­er­al hun­dred meters of this gor­geous blue-grey stone typ­i­cal of the Beaver Hills/Cooking Lake moraine land­form. Tall reeds and grass­es, all dried up by this time, grew from between the stones and above the high water mark there were aspen, birch, and spruce. And then there was this tree — grow­ing near the water in a lit­tle clear­ing. My tim­ing was just right — all the tree’s leaves had turned to this red­dish yel­low, with a few fall­en to the ground to con­trast the colour of the rocks (the next few days were quite windy, strip­ping most of these leaves for the sea­son). 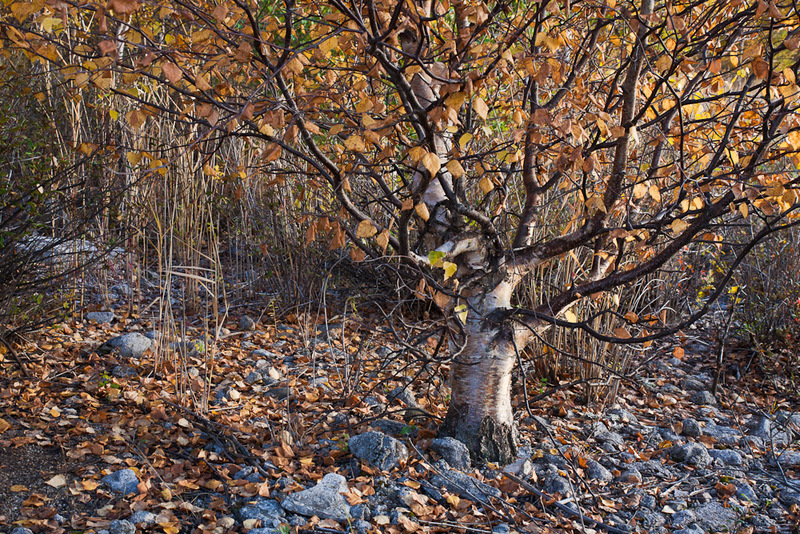 When I first arrived at this spot, the sun was rea­son­ably low in the sky, but the white bark of the birch tree was still reflect­ing too much light and the con­trast was more than my cam­era could cap­ture. 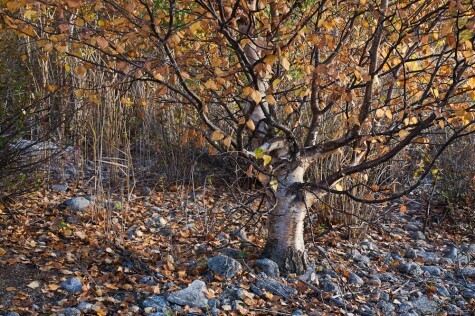 Some­times, brack­et­ing expo­sures and com­bin­ing them to an HDR image for pro­cess­ing can reign in such high-con­trast scenes, but in this case a slight breeze was rustling the leaves and grass stems, which makes it very dif­fi­cult to blend mul­ti­ple expo­sures suc­cess­ful­ly. Look­ing to the west how­ev­er, I noticed that a bank of high stra­tus clouds rose a few degrees above the hori­zon in the oth­er­wise per­fect­ly clear sky. Nor­mal­ly, this is bad news if you’re try­ing to pho­to­graph dra­mat­ic late-day side­light­ing and sun­set colours (which I was try­ing to do). In this case though, I wait­ed until the sun had just dipped behind the thin lead­ing edge of the clouds, caus­ing the light to dim a lit­tle and to dif­fuse ever so slight­ly — reduc­ing the con­trast in the scene, but still light­ing the bril­liant fall colours. I hur­ried to cap­ture a few com­po­si­tions that I’d deter­mined while wait­ing for the light, and far too quick­ly — the light was gone. I walked back to the truck as the lack­lus­tre sky sim­ply grew dark­er with the sun hid­den behind the advanc­ing clouds — but I couldn’t pos­si­bly have been any hap­pi­er.